Back when I was on the Hull Pirates football team, practices ended with sprints. Look up, the coaches exhorted us, there’s no air if you’ve got your head down. I’d look up and perched at the end of the Gut was a windmill. I didn’t realize how novel it was at the time. But it turns out the little out-of-the-way peninsula town where I grew up is finally a leader in something, and something important. Hull, which now has two windmills, is a national leader in wind power. That’s a view now being vindicated by the Wall Street Journal. 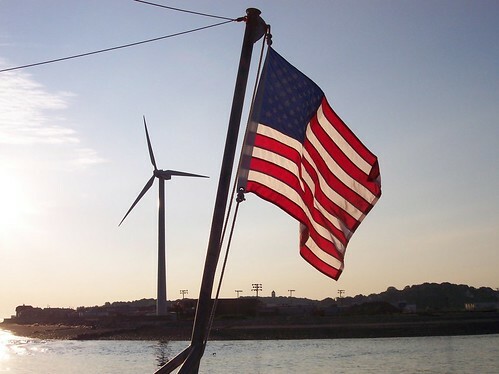 And more: “Since 2001, commuters on the ferry into town from nearby Boston have been greeted by the 165-foot-high wind turbine that Hull built on the shoreline next to its high school. In 2006, with little opposition, Hull erected an even bigger wind turbine on a hill overlooking one of the main roads into town. Connected to the Hull municipal power plant, the two existing turbines now provide about 13% of Hull’s power needs and have kept local electric bills about a third below those of most surrounding communities…A faded tourist town still known for its long, wave-swept beach, Hull sits on a peninsula that juts out into Boston Harbor like a crooked finger. Local residents have been taking advantage of wind power since at least the early 1800s, when windmills were used to make salt from sea water. In 1985, the town erected a small windmill near its high school to help generate electricity for the building. It saved the town an estimated $70,000 in energy bills over its lifetime, but was destroyed in a 1997 storm. Soon after, a group of local citizens and teachers began lobbying town leaders to put up a new windmill at the site, with high-school physics students doing some of the planning. Managers at the town’s power plant, which is overseen by an elected board, bought into the idea and the group got advice from a renewable-energy laboratory at the University of Massachusetts. The wind-power group held multiple public hearings and sent detailed updates out with town electric bills. From the start, the emphasis was on the direct economic benefits the turbine would provide for local residents. At the time, the Hull power plant, with no generating capacity of its own, was buying all of its electricity from elsewhere, paying about eight cents per kilowatt hour. Planners estimated the turbine could produce it for about three cents per kilowatt hour, shaving about $185,000 a year off local utility bills and paying for operation of the town’s street lights. Martin Scorsese once directed a film, Italianamerican about his Little Italy neighborhood in New York. Tonight, Scorsese failed to mention two great Italian Americans who assisted in the making of his film about the Boston Irish. The first is Mayor Thomas M. Menino. Sadly, I ran down to the 5th floor one minute late so I missed Scorsese exiting Mayor Menino’s office at around 9:15 one morning during the making of the film. I’ll never know what went on in the Mayor’s office when the first Italian mayor of Boston met the director who has told the story of America during four decades of public life. I do know that the Mayor gave the greenlight to Scorsese filming on City Hall Plaza and okayed the city’s assistance with this project. The Mayor, in his own way, is partly responsible for an Academy Award. Mark Wahlberg Addendum: Wahlberg has come a long way since he first made it as a star. I first met Wahlberg back in 1991 on Broadway in Lower Manhattan. He was walking past the McDonald’s with two other guys and rapping. He was being tailed by two swooning teenage girls. After they stopped to talk to him, I caught up to him and made small-talk. I knew his family had moved from Dorchester to Braintree, and I made mention of growing up in Hull, the coastline of which had just been devastated by a major storm. Little did either of us realize that Wahlberg would later star in a film about that Nor’easter, The Perfect Storm. Neither did we know that his brother would go on to open what would become the best restaurant in the Town of Hull, Bridgeman’s. In the spirit of my friend Ron Della Chiesa, I urge everyone to visit Bridgeman’s, order a fabulous meal and glass of wine, and toast, Scorsese, Menino, Papa and Wahlberg on this wonderful achievement. Matt Damon Addendum: Matt Damon lived at Harvard’s Lowell House the same time I did. We both lifted weights at the Malkin Athletic Center, the MAC. Matt was always a very friendly person, and we would converse in the Lowell House Dining Room. I believe he was particularly friendly to me as I was one of the small percentage of local kids in the House. At any rate, he was a nice guy. All I have to say now is thank God Matt Damon never listened to the likes of me. Damon had faith in himself that he could be a serious actor. I’m sure he would have made a fortune as Brandon Walsh, but Damon’s destiny lay in being a serious actor. Like Wahlberg and DiCaprio, he’s one of the best. He has a great career ahead of him, which is reassuring because he is an excellent guy, who deserves all the success he gets.